(203)-805-7273 // Orders over $1,500.00: Call for Volume Priced Discounts. The solution to successful overspray collection is having the right air filtration equipment for the right job. Filtration is essential in creating a quality finished product, but one collector will not perform for all uses. Each of our filters is made with compliance and coating requirements in mind to provide the painting, coating and HVAC industries with great performance and extended service life for both spraybooths and air handlers. 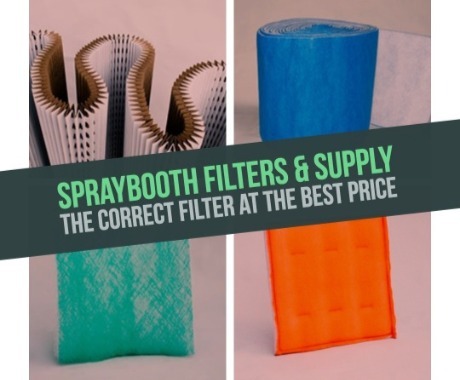 Whether you are a residential customer purchasing a single filter or a commercial customer requiring shipments by the truckload, we’re committed to finding you the correct filter at the best price. We have the largest line of filters for all uses, delivered promptly with unparalleled customer service. Our filters reduce the danger of combustible particles exhausted from the booth, are available in pads and rolls in a wide variety of widths and lengths and in many cases can be customized to meet your unique needs. Shop now and let us help you keep your booth efficient, safe and clean!